Fruit crumble is one of my favourite desserts, both to eat and to make. I haven't made one for quite a few years though, ever since I became gluten-free on medical advice. The classic recipe using rolled oats isn't safe for me. At the time I threw out the few baking supplies I had and until the weekend, I hadn't ventured into the difficult sounding gluten-free baking arena. I decided to investigate making a gluten-free crumble on Saturday night, and after looking at a few recipes online I came up with my own. I'm not very good at following recipes to the letter and will often take a quick look to get the gist and go by feel. The above apple and boysenberry crumble was such a hit with my husband that he said it was the best crumble he'd ever had, 'even gluten-included crumbles'. It was pretty good actually. It had that slight chewiness of caramelised buttery biscuits (cookies). We had ours with vanilla ice cream. I don't know what other countries call a crumble - maybe a cobbler or a crisp? Anyway, here's my recipe. You could use different fruit or just go with the classic Apple Crumble by using 4-6 granny smith apples by themselves. If using fresh apples only, I would dot with 6-8 small cubes of butter and sprinkle with a little bit of brown sugar. You will only want to use granny smith apples (they are green and quite tart) because they are far nicer than using sweet red apples. Pulse the crumble mixture briefly in a food processor until it resembles lumpy rubble in texture. You do not want to blend it until it is completely smooth. Alternatively rub the butter into the flour and then mix in the other ingredients. I hope you enjoy this recipe if you decide to try it. And I'd love to hear, what is your favourite dessert to make and/or eat? Are you a chocolate girl or more into fruit desserts? I love fruit desserts personally, but I can be persuaded with anything caramel. Mmmm, that looks delish! I'm recently gluten free (also on medical advice). Fruit crumbles are my husband's favourite dessert, so I've been looking for a good gluten free recipe that he would enjoy as much as my pre-gluten free one. I'm absolutely going to make this next weekend. It's summer here in Canada, and I have rhubarb in the garden plus berries are in season, so I might try it with rhubarb and strawberries. That looks so good. I love rhubarb crumble and also cherry crumble (using bottled cherries). Lovely with some ice cream or custard. I love desserts like this. They always smell so delicious when baking. Thank you for the recipe. It looks divine! I have some boring blood sugar issues so my favorite dessert is wild blueberries from my secret patch covered with heavy cream! Oh divine ! From the moment I read the title I was salivating. Boysenberries remind me of beautiful, delicious, extraordinary NZ boysenberry ice cream. Best eaten in NZ, of course. With a cone. Mmmmm. It's odd as I don't like ice cream and only eat gelato when on holidays but boysenberry ice cream makes my toes curl. That recipe sounds divine. I have made one or two GF crumbles (yes, we share the same name here in Australia) in the past two years since reluctantly adopting GF under medical advice. They weren't successful so I gave up. I think it's time to try again - with your recipe as a guide. I like cream and custard (just a splash of each). I have made apple and apricot crumbles in the past. Using tinned fruits for convenience. The combination of those two flavours is delicious. I made rice pudding last night, using the recipe from the Edmonds cookbook (p 219 I think ?). I added a little cinnamon and the house smelt DIVINE. old fashioned, homemade comfort foods are my favourite. Fancy shmancy meals in posh restaurants are all very fine but give me a lamb roast and old fashioned dessert anyday. Dad (to sons): 'Look at this, fellas. You don't get this in a restaurant'. One of my favourite scenes from the Australian film 'The Castle'. 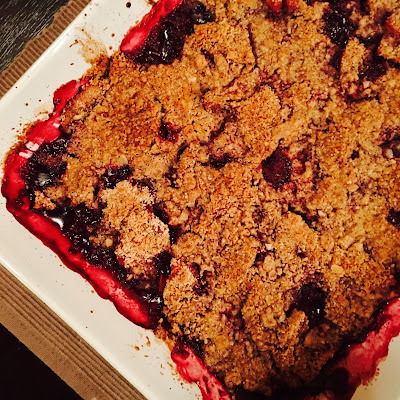 Sounds like a great twist on the classic crumble, Fiona, thanks for sharing it with us. We're a gluten-inclusive (love that!) household and hubby can't digest coconut well, but I fancy trying it with almonds added. I'm guessing your almond meal is our ground almonds. Wishing you a chic day 21! Catherine, rhubarb crumble is such a classic, yum. I've made it by itself and with apple, but berries would be amazing with rhubarb too. Margaret, with cherries - beautiful! I've not seen bottled cherries, I wonder if we can get them here. Stephanie, it does smell amazing whilst baking. Pre-sets and mega-base on the Walkman. PP, it will be just as yummy without the coconut, we just both love it. You could do 1C flour if you didn't have almond meal, which I'm sure is the same as ground almonds. It's almonds ground to a fine grit.